WOW!!! 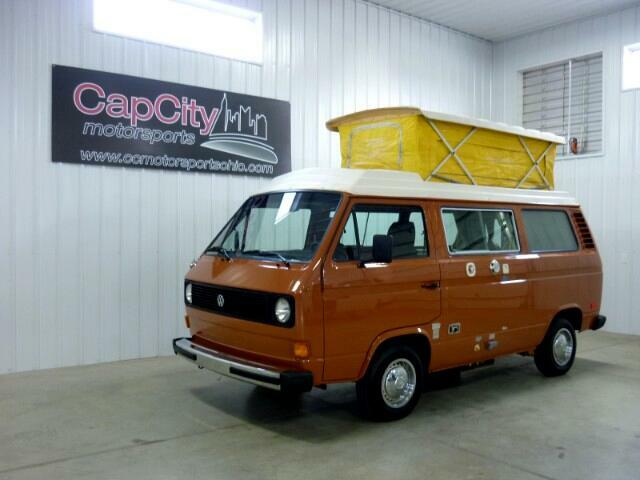 CCMS is offering this 1980 Volkswagen Vanagon ASI "Riviera" FULL Camper in AMAZING condition!! This one is GORGEOUS!! Showing 33K Original miles and it looks the part!! It is finished in the Assuan Brown over a partial Vinyl/Cloth interior! The body, interior and underside look UNREAL!! This engine is the best running Aircooled 2.0L we've had the pleasure of driving! All the Camping/Kitchen equipment are currently in working order! This unique package had a fridge, furnace, stove, sink and MORE!! This has DUAL Propane tanks underneath! The heavy duty canvas top on the Pop-Top is still in nice shape! We did a service on it just to help insure that the new owners would be able to head out and camp with ease! The 4-speed manual shifts great! ALL original manuals are here! We believe this Vanagon to be as "real" as it gets!! It is truly an amazing find and we are so fortunate that we were able spend some time with it before passing it on! Don't miss it! Call or email for immediate assistance! Visit Cap City Motorsports LLC online at www.ccmotorsportsohio.com to see more pictures of this vehicle or call us at 614-504-6002 today to schedule your test drive. Message: Thought you might be interested in this 1980 Volkswagen Vanagon.